1. Preheat the oven to 200°C. Place lamb in a roasting dish. Combine the breadcrumbs, herbs, garlic and pesto in a bowl, mix well. Press the breadcrumb mixture evenly over lamb racks. 3. Remove lamb from oven and rest for 15 minutes before carving. 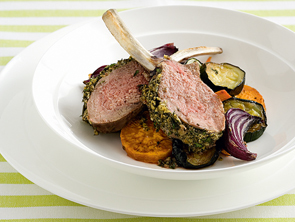 Carefully remove lamb from oven bag, place lamb on a serving plate and pour over any juices. Suggested roasting times for Rack of lamb, four rib roast, crown roast: Cook at 200ºC. Rare 20-25 min total regardless of weight, Medium 30-35 min total regardless of weight, Well done 40-45 min total regardless of weight. Tip: Roasts need to rest for about 10 to 20 minutes before carving.